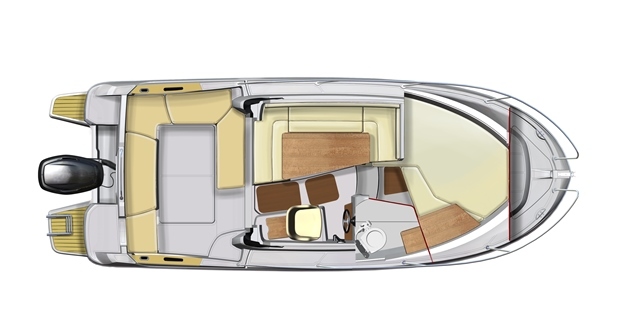 The Antares 7.80 is the ideal boat for quick day breaks or short cruises. Comfortable, smart and functional, the design focusses on ergonomics and layout to make life easy on board. This is a versatile multi-programme boat that will adapt well to all your get-away trips. Designed by SARRAZIN DESIGN, the Antares 7.8 has classic traditional lines that withstand the test of time. This range is the legacy of the Beneteau brand’s first recreational fishing boats. Regularly given a facelift, the hull of the current edition is decorated with a red line adding character to the models. The incredibly bright and spacious wheelhouse has a U-shaped saloon that can be converted into a double berth. The interior design uses walnut woodwork matching the beige upholstery and navy-coloured curtains. The result is a very simple warm and welcoming atmosphere. Created to make boating and living on board a pleasure, the Antares 7.80’s fittings and equipment have also been designed to optimize safety. Getting about on board is easy thanks to the asymmetric walkways (port: 15 cm, starboard: 20 cm). The grab rails and the pulpit protect movement from the bow to the cockpit. The single-piece windshield provides perfect visibility. The cockpit saloon converts into a large sun-lounger and has lockers underneath the seats. The fore cabin has a spacious double berth and also has a hanging locker. The convertible saloon offers an additional double berth. The small galley has a 42 L icebox (refrigerated on option), a sink and a place for a hob. The heads compartment (marine or chemical toilet on option) is separate and also has stowage. The outboard engine is economical and high-performing. 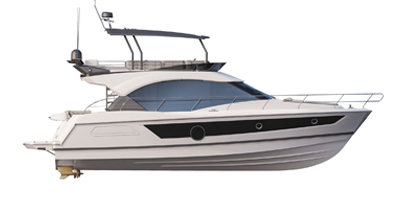 The maximum power output of the Antares 7.80 engine is 300 HP. CE Certification C8 / D8 - maximum 8 passengers on board. Lockers in the cockpit seats. Large forward double berth: 2.20 m x 1.20 m, hanging locker. Steering station: panoramic windshield, flush engine control, space for electronics, bolster function seat. Separate heads compartment (marine or chemical toilet on option) and stowage. Hatch and opening port-light in the wheelhouse.